The Vegetable Ranch and Bob Bower of Kearsarge Gore Farm. One thing or another kept me plenty busy and I never followed up on that New Hampshire brainchild. Until now. In October I realized that this issue of The Natural Farmer on Organic Aggregation was a perfect opportunity for me to check out that misty memory. Was it still alive? Had crusty New Hampshirite (that is the official term, says the Government Publishing Office, honest!) farmers managed to work together this long? Were there fatalities? So I contacted Dave Trumble of Good Earth Farm in Weare, one of the original farmers who put the idea together, and arranged a visit to the Local Harvest CSA in Concord, NH. This is the 15th continuous season for the CSA, and from the start they have been housed at the Unitarian Universalist Church in Concord. It has a nice location less than 5 minutes from Interstate 89 in West Concord. The organization is run by the participating farmers, currently 6 of them. All the produce and fruit is certified organic and has been that way from the beginning. Meat and dairy options have been offered at times, but none are available right now. In those cases, if no certified organic product is available the CSA may decide to allow non-organic to be sold. In the past a dairy farm brought yogurt and milk, but they were a small operation and had to send someone for the whole day so they decided not to keep coming. The CSA was popular right from the beginning. 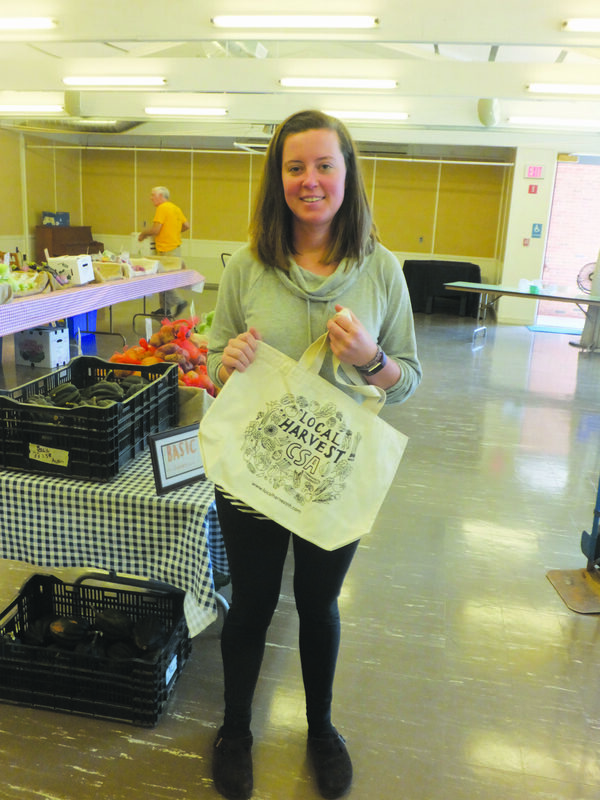 As a way to serve more people and those farther away, the CSA has added a second day when shares are delivered to a number of sites around southern New Hampshire. The satellites have helped bring in some members, but the competition is still strong. Of course all the farms also have other markets besides the Local Harvest CSA — their own CSAs or farmers markets, farm stands, restaurants, wholesale sales, etc. So in the summer it is hard to get the farmers to a meeting to make decisions, but in the winter they meet multiple times to talk about changes in prices, locations, purchases they are going to make, etc. They also talk about who is going to grow what crops and if someone drops a crop who is going to pick it up. Farms get paid every week and bring an invoice for what they deliver. 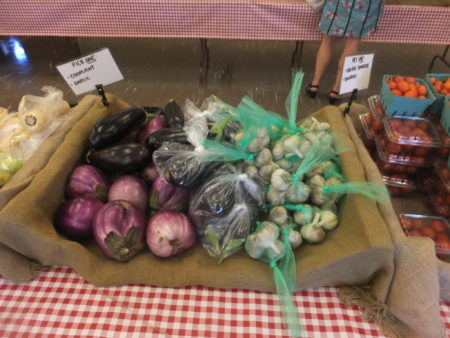 Many of the items at the CSA show it’s “market style” by giving the customer a choice of which produce to choose. The six farms that currently contribute produce to the CSA are Blue Ox in Enfield, Good Earth in Weare, Middle Branch in New Boston, The Vegetable Ranch in Warner, Stoneridge in Bradford, and Kearsarge Gore in Warner. Each of the 6 has a representative on the CSA board and some serve as officers. Everyone votes on any change in prices. The part time staff is Anna and Erin Insley, plus Dave and a bookkeeper. “I have a small CSA of my own,” he continues, “along with Local Harvest, and also sell to restaurants, so I grow the full range of crops. I grow a lot of lettuce, tomatoes, shallots, onions, peppers, carrots, beets, and winter squash because I have good markets for them. Before I farmed for market, I grew a garden for my own use, and always avoided chemical inputs for food safety issues. It seemed natural to extend those methods when I began to market my produce, and especially because it seemed that more people were interested in buying organically grown foods. Ten years ago I had read a Gene Logsdon book that promoted small farms and cottage industries and that stuck with me. I enjoy being outdoors and wanted a business of my own and decided to try farming. Anna is a primary staffer for the CSA program. Dave Trumble, who raises organic seedlings (vegetables, herbs and flowers) at Good Earth Farm and specializes in tomatoes and root crops, says: “We grow just a handful of crops for Local Harvest CSA: bedding plants, greenhouse tomatoes, onions, garlic, carrots, beets and peaches. We ran our own 100+ member CSA for over ten years before Local Harvest. Then we had two children and I became a stay at home dad. Switching from growing 40 crops to growing a smaller number of crops was the only way for me to remain a farmer. “Like a lot of things,” Dave observes, “the best and hardest parts of something spring from the same root. Farming is both a way of life and a job. Farming is right outside your door and is with you every day throughout the seasons. It is a real blessing to live on a farm and have such good work to do each and every day. The hardest part is treating farming like a job and applying a financial perspective to your work as well. In addition to farming, I have a part-time winter job and my wife, Linda, is a school teacher. We could not exist on our farm income alone. The farm pays for itself, including all repairs and equipment needed, and also provides a share of our family income. If we were to add up all farm income and subtract all farm expenses, we make about $10-12 an hour as farmers. We sell at least 80% of our produce through this CSA. Bob Bower and Jennifer Ohler own and operate the Kearsarge Gore Farm with much help from their children, Sam and Abby, and a small but enthusiastic farm crew. The farm has 7 acres and 2 hoop houses in certified organic produce, 20 acres in pasture and hayfield, and 450 acres of woodlot. I met Sarah Hansen, one of the farm workers there, when I visited Local Harvest. She was delivering produce, including some Italian giant dandelion greens she was very excited about. Sarah says Kearsarge Gore Farm probably sells 25 or 30% of their farm product at the CSA. Roger Noonan farms on over 40 acres at Middle Branch Farm with his wife, Lori, and their two children, Heather and Jake, who are in their 20s and quite active on the farm. Lori has an off-farm job and helps with the farming; Roger farms full-time. 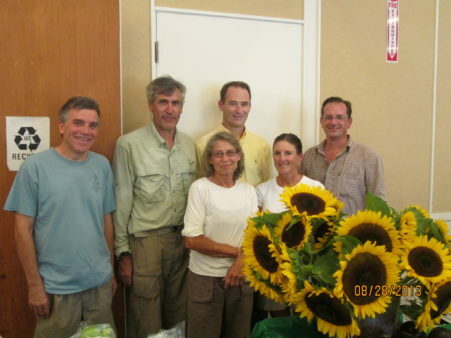 Middle Branch Farm is currently the largest certified organic farm in NH. “I farm organically,” Roger states, “because it makes economic sense and I believe in the process. When the focus is on building the soil with compost to feed the plants, instead of relying on bought-in petroleum based, chemical inputs, organic farming makes the most sense. I discovered this back in high school when I found my grandfather’s copy of the 1949 book, The Organic Method on the Farm by J.I. Rodale. The book talked a lot about composting and that was very interesting to me. At Marlboro College in VT, a school full of farmer/back-to-the-land types, I was introduced to Plowman’s Folly, by Edward Faulkner. That book focused on the depletion of soils from traditional farming methods that destroyed soil structure and made up for it with chemical inputs; Faulkner explained how natural farming not only builds soil but creates healthy plants that resist pests. It completed the picture for me. Organic farming is more about soil building for me than the pesticide issue. After college I went on to do several other things and then started to farm about 10 years ago. “I grow a full range of vegetables because I run a full season CSA on my farm,” he continues, “as well as grow for Local Harvest. I raise potatoes, winter squash, peppers and tomatoes both for Local Harvest and for some wholesale accounts – if I can focus on several crops instead of all the crops, I can become more effective and reduce the cost of production. That is a plan for the future. We also grow lots of hay for sale and for our beef and pork production. Doug and Carol Troy started Stoneridge Farm nine years ago as a way to live a more rural lifestyle and allow their children to experience another side of life. At Stoneridge they grow a wide variety of crops, but specialize in fruits and flowers. Larry Pletcher of the Vegetable Ranch will be farming on 8 to 10 acres next year. 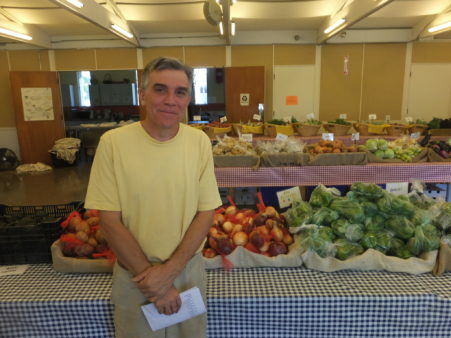 He was the president of NOFA-NH and feels strongly about organic production: “I started to farm organically because I am concerned about the health effects of pesticides and persistent chemical fertilizers. I believe that organic produce is better tasting and healthier for the consumer. I grow a wide range of produce – over 40 different vegetables – because it would be dull to grow only a few items. Also, diversity means that I will have food to offer despite current challenges such as blight or bad weather. No matter how bad the weather is – some selection of vegetables will love it. “Do I make a livable profit,” he asks? “Not an easy question. For the last eight years I have always made a profit. But for the first few years I would not have been able to live only off the farm profits. I was fortunate enough to be able to invest early profits into farm infrastructure. I think we have now arrived at a point where the farm is financially sustainable. Farming is all about scale – not so large as to be industrial or tempted by shortcuts – but large enough so that proceeds from crop sales will be enough to support a family. I would encourage anyone’s children or grandchildren to continue farming – but only if they loved it. Larry estimates that 20% of his sales come from the CSA. 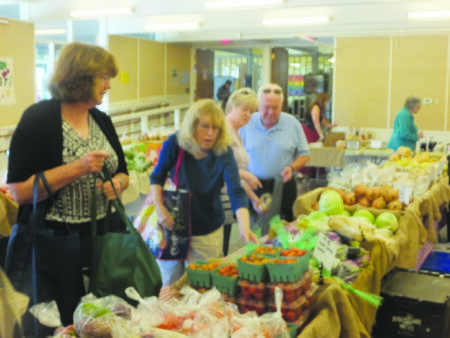 His main market is Concord Hospital, where the Vegetable Ranch supplies the food service and sells an organic share of produce each Tuesday for $18 that anyone can pick up. 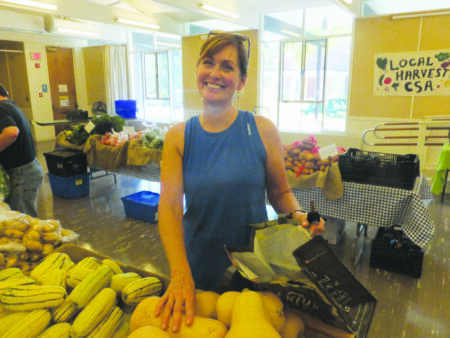 Local Harvest shares are sold in three seasonal groups and come in up to three sizes, depending on the household’s interest in vegetables. The Summer share runs for 18 weeks and comes in 3 sizes. A basic share gets you 5 to 6 items per week and costs $385. A standard share provides 7 to 9 items each week and costs $570. A full share, for the veggie consuming family offers 11 to 13 items for $810. A Spring share of only three weeks is for those who love greens and can’t wait to be eating veggies after a winter off. Two sizes include a standard share at $89 or a full share at $135. The Fall share lasts 5 weeks and the standard one is priced at $155 while the full is $232. In addition to any share, you can preorder one or two loaves of organic bread for $5 each. 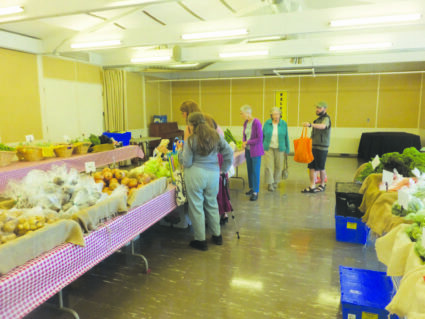 The CSA runs on Wednesdays with the farmers coming between 12:30 and 2:00 to drop off and the members picking up their shares from 2:30 until 6:30. Three rows of tables are set up, with the first row containing the items for a basic share, the second row the items for the standard share, and the third the full share items. The first step in the weekly process is determining how many shares will be picked up. Members are asked to let Anna know before Friday if they will be away and not picking up their share the next week. If they are timely, they can get a double share for a later week to make up for the ‘vacation’ week missed. David Trumble is one of the founding farmers of Local Harvest. Then on the weekend Anna sends Dave Trumble the number of shares that will be picked up for each site, each day, and each share size. The farmers also send Dave a list of all the crops that they are going to have available on Wednesday and Thursday. “They’ll say ‘I’m going to have 50 eggplants or so many pounds of this,’” explains Anna. “Then Dave sits there and looks at what everyone is offering and how many we need and does matching magic. He sends the list out to everyone and they bring what he ordered. “Of course Dave doesn’t necessarily take everything that is offered,” she continues. “If 50 of something is available he might take 40 so we can give people more choices. This CSA is set up like a market style CSA. That means people go through and make some choices. They might have a number of baskets where they need to take either one thing or another. The Wednesday pickup is a real social occasion with people greeting each other and discussing weather, politics, and the state of the produce. As for that, I was amazed how good the produce looked. Large, uniform, clean and appealing vegetables were everywhere, as if I was in a photo shoot rather than a CSA. Options were clearly labeled when there was a choice, with plenty of each one available – at least when the first customers showed up just before 2:30. When customers first come in they sign off on a list. That way the CSA can keep track of members who don’t come for several weeks so they can find out if there is a problem. Any produce left at the close of day is donated to a food bank. The swap table today is quite popular. I see a number of items on it after a few customers have been there – different items than the random vegetables initially thrown on it to get things started. People regularly trade out items in their shares with stuff on the table. “We have members whose reasons for joining,” says Anna, “are all over the map. Some do it because they want to eat better, some want to support local food, Some like the CSA idea, we have a lot of families – that is the number one group, also people in one person households, then some in their early twenties and all ages in between. But the most average is a family unit. I talked with some of the buyers. A woman who refused to give her name and declined having her picture taken said: “I’ve been a member for 7 years. It is really important to support local farmers. I probably spend more on fresh local produce because I purchase this. I think you end up paying a little bit more. But you end up with really nice looking leeks compared with what you get in the grocery store. When I started out there were four of us at home, and now there are only two. But we eat a lot of vegetables. I don’t use kale, but I put that on the swap table. This time of year we eat salad or grilled vegetables like eggplant. My daughter is coming home and wants kale, which is not my favorite (groans). But we have to support the farmers. Why? Because I don’t want to be buying all my produce from somewhere that I’m not sure how they are taking care of my vegetables. I don’t want goats in the same field from which I’m getting tomatoes. These people are very nice, very caring. If you have any problems they always try to deal with them. It is a nice place to do business! On Thursdays the farmers deliver again in the morning and the staff pack about 100 bags for members at the delivery sites. “We take them to all the different sites where members pick up,” explains Anna. “We have three here in Concord, one in Bedford and one in Hooksett. Kearsarge Gore farm has a van that can take the 30 or 35 bins that we need to pack all the shares into. We share the driving. We also have a share distribution at a state office building that is only for state employees – we don’t publicize that. We can get people that work there but live 45 minutes or more away. These are people who are seeking out organic food and this is a good way for them to get it even though they don’t live in Concord. Sometimes people buy a share for their mom or their kid, too. “Those types of members show up,” she continues, “grab their bag, and turn in their empty bag from the week before. There is no charge for delivery, and the CSA is glad to add a new site if at least 15 people will join to pick up there. The CSA has a large database of past members who are kept informed about the operation and invited to rejoin. The staff also go to different events to publicize the CSA. Especially in the winter.